Johan Medina was born in Arequipa, Peru on the 31st of January, 1978. He did his elementary school studies at the Peruvian International Elementary School in Arequipa from 1982 to 1989. Then he finished his high-school studies at the Peruvian International High School (from 1990 to 1994) being awarded the "Excellence Diploma" for his outstanding performance during the high school term. He also received the "Man of Honor Diploma" for his exemplary behaviour towards his teachers and schoolmates. 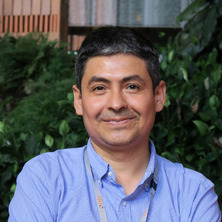 Later, he studied Human Medicine at the Faculty of Medicine of the San Agustin University (Arequipa, Peru) from 1995 to 2002 and graduated as a "Surgeon-Physician" on March 2002. Upon graduation, he worked as a General Physician in several Medical Institutions of Arequipa ( Goyeneche Hospital, TRM Hospital, Santa Maria Medical Clinic and San Juan de Dios Medical Clinic) developing his clinical skills but his growing interest in scientific research made him apply in a very competitive process to get an scholarship awarded by the Japanese Ministry of Education, Culture, Science and Technology (Mombukagakusho Scholarship) on 2005. He was granted the scholarship and selected the Institute for Molecular and Cellular Regulation, Department of Cell Physiology (University of Gunma, Japan) to perform his PhD studies which he finished on march 2009. Then, he worked as a Post-doctoral Researcher for the University of Toyohashi (Japan) having at the same time Visiting Researcher duties at the University of Hamamatsu (School of Medicine), the Tokoha Gakuen University (Department of Health and Nutrition) and the Okazaki Institute for Integrative Biosciences (Department of Cell Signalling). Currently, he is working as a Post-doctoral Research Fellow in the Cytokine Receptor Signalling Group led by Dr Andrew Brooks at the Translational Research Institute - Diamantina Institute (University of Queensland, Australia). Since I graduated from the Faculty of Medicine, I have been interested in translating research work into useful approaches to diagnose or treat diseases. For that reason, I've been involved in several clinical research projects before applying to my PhD course. Some of them, are as follows: "Histologic grade and histologic type of breast cancer in patients who underwent a radical modified mastectomy in the Goyeneche Hospital in the years from 1980 to 2001" and "Tumoral size and axillary ganglia compromise in breast cancer patients who underwent a radical modified mastectomy in the Goyeneche Hospital in the years from 1980 to 2001". This clinical research information led to the reassessment of the benefits of the immediate radical modified mastectomy as the best and only treatment for breast cancer patients who presented a positive sentinel lymph node. I was also involved in other research works whose findings were used as a reference to establish preventive methods against the studied pathologies. These researches were: “Use of the reflexology to manage the stress in San Pablo University students”, “The prevalence of isolated bacteria in secretions of patients suspected to have intrahospitalary infections” and “The work of a traffic officer as a risk factor to develop pterigyum”. My research project performed in The Institute for Molecular and Cellular Regulation in Gunma University during my PhD course unveiled several genes that were differentially expressed after liver proliferation induced by follistatin administration. Further studies revealed that follistatin can be used as a selective growth promoter as it acts as a growth promoter for hepatocytes but not for cancer cells. My work done characterizing the interfacial model between neuron-like cells or neurons and a silicon nitride based surface led to the improvement of the conditions that were used for the culture of primary isolated hippocampal neurons on biocompatible materials that were subsequently used for the production of a bio-image sensor for simoultaneous detection of multi-neurotansmitters including acetylcholine and ATP in real-time as well as the production of a multi-ion image sensor capable of detecting capable of detecting changes in potassium and calcium concentrations in the aqueous environment surrounding the neurons. Further related studies are being successfully perfomed in The Toyohashi University of Technology in Japan. The reassessment of the presence of a glucose-sensing receptor comprises the main impact of my last postdoctoral position project as it will stir up the way insulin secretion model was being described and it will contribute to the development of new approaches for the treatment of patients suffering from diabetes mellitus.